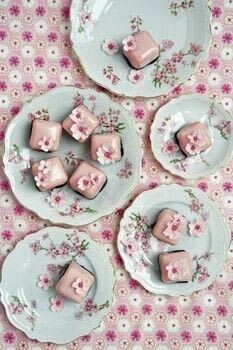 Recipe for cherry blossom bites fondant fancies. 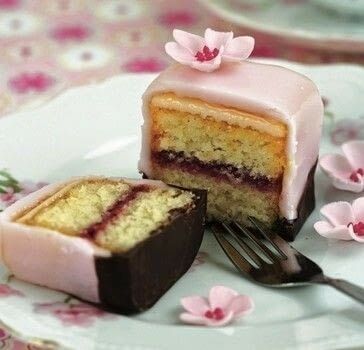 Mix the sugar florist paste with a tiny drop of claret food colour to a very pale pink. If the paste is very stiff and sticky, add a dab of the white vegetable fat and knead it until it is smooth and pliable. Place one flower shape at a time on the foam flower pad and keep the remaining flower shapes on the plastic board covered with the Stayfresh multi-mat to prevent them from drying out. To shape the petals, move the thicker end of the bone tool gently across each one until it is think and slightly frilly, being very careful not to tear it. Once all the petals have been shaped, place the flower into the well of the plastic palette that has been lightly dusted with cornflour to prevent the flower from sticking to it. Repeat steps 3-5 for all the remaining flowers and let them dry for at least 4 hours or overnight. Once dry, lightly dust the flower centres with the dark-pink dust colour using the fine artist's brush. To make the colour dust slightly paler, you can mix it with a small amount of cornflour. Mix about half the royal icing with the claret food colour and a small amount of water to a soft-peak consistency. Put it in a paper piping bag, snip a small tip off the bag to pipe small dots in the centre of each flower. <b>To temper the chocolate</b> Place 150g of chocolate buttons in a microwaveable bowl and melt it gently on medium heat. Be careful not to overheat it, as chocolate can burn easily. Check the temperature with a thermometer; it should be melted and between 44 and 48"C.
Once it has reached the required temperature, stir the remaining chocolate buttons into the melted chocolate to cool it down to about 28"C while stirring. Once the chocolate has cooled down, gently warm it up again to 32-34'C and the chocolate should now be tempered. You can test it by dipping the blade of a palette knife into the chocolate - it should set within a few minutes and have a silky satiny texture. <b>To dip the fondant fancies in the chocolate</b> Once the chocolate has been tempered, have a dampened J-cloth at hand, lightly wet your fingers with it and pick up one fondant fancy at a time (this will stop your fingers from sticking to the fondant) and dip the bottom into the chocolate until covered. Place each on a wire rack for a few minutes to allow the excess chocolate to drip off and transfer it to a sheet of greaseproof paper to let it set. Repeat for all the remaining fondant fancies. 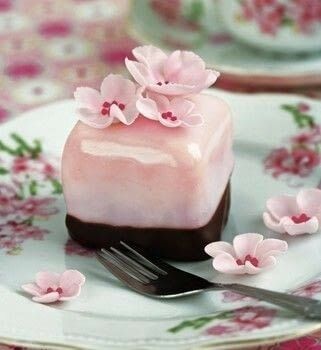 <b>To finish</b> Put the remaining white icing into a paper piping bag and use it to stick the cherry blossoms randomly on top of the fondant fancies. Store at room temperature for about 3 - 5 days.